9. Hold a donation drive at work, church, or even with friends & neighbors! Collect items or purchase a few from our Amazon Wish List. Here are just a few of the items we always need: Bleach, Laundry Detergent, Kitty Litter, Wet Cat Food, Collars (Medium/Large), Treats, Toys, Beds, Wire Crates, X-Pens, Puppy Pads, Leashes, and Gift Cards. 7. Sign up as a foster family or a temporary foster family this holiday! Many of our foster families are going out of town and we need some kind, loving people to open their homes to a furry buddy. By allowing them into your home instead of at the shelter, we can continue to rescue those living on the streets who need us. And don't worry, if you fall in love you can always adopt! 6. Sign up to give monthly, whether it is $5, $10, or $20! Our monthly donors allow us to count on these funds, so when an emergency case comes in, we know we have the funding and can say YES without delay! 5. Donate your gently used blankets & towels - every dog and cat is comfy and warm, and we can always use more. Our address is 2320 Pine Street, St. Louis MO 63103. 4. Donate that old jalopy! Hanging on to an old car and not sure what to do with it? 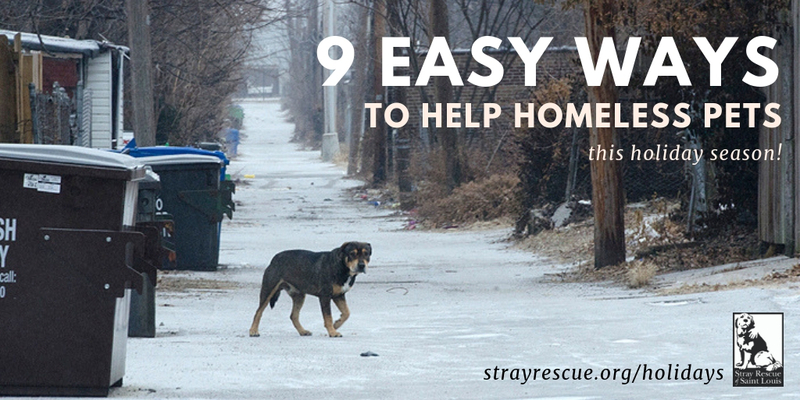 It's EASY to donate it to Stray Rescue! 3. Give a donation as a gift! We'll send them a special card in the mail letting them know you made a life-saving gift in their name. For more info, click here! 2. The easiest way to help: Share our posts of adoptable dogs and cats!! By sharing our adoptable pets on your social media pages, someone that may not have considered adoption before might fall in love with a face and come meet them! Follow us on Facebook, Instagram (strayrescuestl), and Twitter. 1. The greatest gift of all: Open your heart and your home by adopting. December is our slowest month for adoptions and yet one of the busiest on the streets. When you adopt, you save TWO lives, the one you are adding to your family and the one who takes their place in the shelter. Plus, Tito's Handmade Vodka and Randall's Wine & Spirits are paying adoption fees for dogs/cats over 6 months old from now until December 31! Our matchmakers will help you find the perfect addition!